Decorating Easter eggs is an American tradition. With a Classic Egg Decorating Kit from Paas, you can create all kinds of amazing-looking Easter eggs. The color dries fast (around 3 minutes) so there's no long waiting time for your eggs to dry. 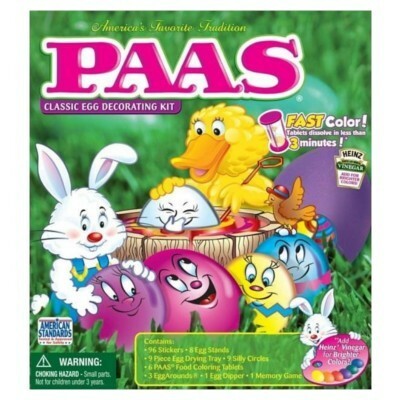 Plus 4.8oz Paas Egg kit comes with everything you need: 8 egg stands, a dying tray, and fun stickers and circles to decorate your eggs. Put 1 tablet in a cup. Add 1 tablespoon vinegar or water. Let tablet dissolve. Add 1/2 cup room temperature water. Dip egg until preferred color. Caution: Non food product. Do not eat. Not for children under 3 years of age.